The other night I rewatched last years Oscar winning Pixar film Inside Out, and the truth is undeniable: it's a masterpiece. Despite already seeing the movie, I sat there in awe of the screenplay and the joyous characters and just how ingenious the whole experience is. It's a feat that is worthy of more praise than I can heap on it, to balance a story that kids can be thrilled by yet will also bring tears to the eyes of adults because of how brilliantly the emotional experience of adolescence is portrayed. It's a practically perfect work and in my world, Pixar's finest. Also released last year was another Pixar original, The Good Dinosaur, and while it never had a chance to live up to the pure beauty of Inside Out, at the very least it brought us into a new world with new characters and it featured a spectacular and innovative style of animation that put cartoon creatures against a ultra realistic backdrop. Therefore, it is understandable that the idea of the studio delving into a sequel again was a bit of a letdown for many. Knowing the adventures that the team of animators and storytellers are capable of taking us on, a feeling of familiarity is disappointing. 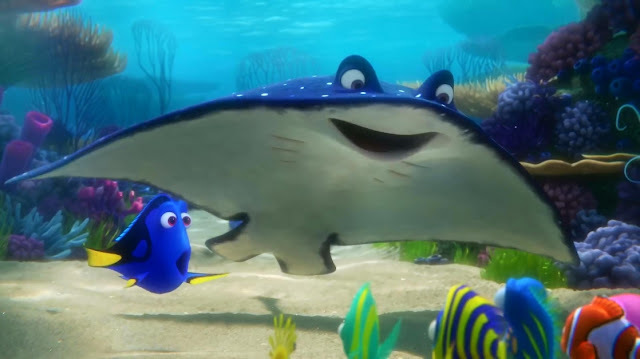 But this is Finding Dory we are talking about here, and the rich and highly detailed underwater world created by Andrew Stanton (among many other wonderfully talented people) with Finding Nemo in 2003 is a place I am more than willing to revisit. Without a doubt this film never had a chance of playing as strongly as Inside Out, the original Nemo or any of their other modern classics but after entering the cinema keeping my expectations in check, Finding Dory is an absolute delight. Within minutes we are given a backstory to the Dory character and just like that I knew that the original film would be enhanced with this knowledge. It's a beautiful thing, to not only entertain in the moment but also build upon the groundwork that was laid over a decade ago, and knowing more about Dory sheds so much light on the emotional weight of her plight all along. The film never lets down in this regard either, using flashbacks and current moments to make the audience laugh and also break our hearts in order to add a ton of depth to a tiny blue fish voiced by Ellen DeGeneres (who as expected is terrific here). All the new characters are fun and interesting and perfectly cast, especially an Octopus (or is it Septopus?) named Hank that is just spot on utilizing the talents of Ed O'Neill. I admired the storytelling balance that was struck in Finding Dory because despite the fact that it's going to be a box office home run for it's bright colors and top notch ability to embrace the fun of going to the movies as a family, there is so much sorrow to be found in these frames and I fell in love with the way it all felt genuine and important. There were a few shots in particular of Dory when the sea didn't seem to be so vibrant and the scenes were dripping with so much loneliness and despite all the laughs and smiles, these were the moments that are sticking with me the next day. Pixar has a terrific handle on telling a complete and nuanced story. 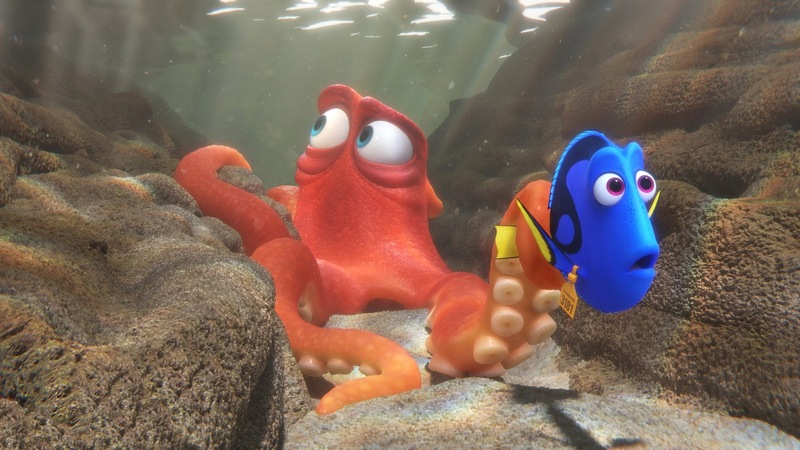 Does Finding Dory suffer a bit from sequel fatigue? Perhaps. I don't mind though. The last time I went on a journey with these characters I was 19 years old. I had not met my wife yet and I was years away from bringing a beautiful little girl into this world. Being able to sit with both of them 13 years later in a movie theater and experience a combination of the names and voices we already love with new locations and new motivations just felt right.